The Karoon River basin, with a basin area of 67,000 km2, is located in the southern part of Iran. Monthly measurements of the discharge and the water quality variables have been monitored at the Gatvand and Khorramshahr stations of the Karoon River on a monthly basis for the period 1967’005 and 1969’005 for Gatvand and Khorramshahr stations, respectively. 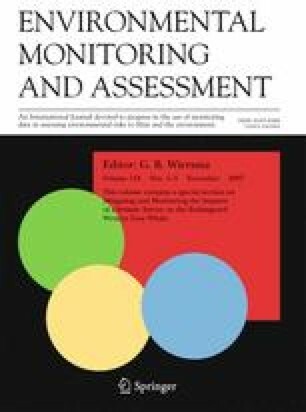 In this paper the time series of monthly values of water quality parameters and the discharge were analyzed using statistical methods and the existence of trends and the evaluation of the best fitted models were performed. The Kolmogorov–Smirnov test was used to select the theoretical distribution which best fitted the data. Simple regression was used to examine the concentration-time relationships. The concentration-time relationships showed better correlation in Khorramshahr station than that of Gatvand station. The exponential model expresses better concentration ’time relationships in Khorramshahr station, but in Gatvand station the logarithmic model is more fitted. The correlation coefficients are positive for all of the variables in Khorramshahr station also in Gatvand station all of the variables are positive except magnesium (Mg2+), bicarbonates (HCO 3 − ) and temporary hardness which shows a decreasing relationship. The logarithmic and the exponential models describe better the concentration-time relationships for two stations.